One of our readers correctly pointed out that yesterday's photo must have been taken at South African Breweries in Newlands. SAB produce many different beers and other alcoholic beverages in their seven breweries located in six provinces across the country, including Carling Black Label - the first beer I remember taking a liking to! After visiting the main control room at SAB we headed down to a huge room with a maize of impeccably clean stainless steel pipes that seemed to head in every which way. While the rest of my group was lectured on the process followed in this room, I took the opportunity to capture a few pictures that I'll be sharing with you. 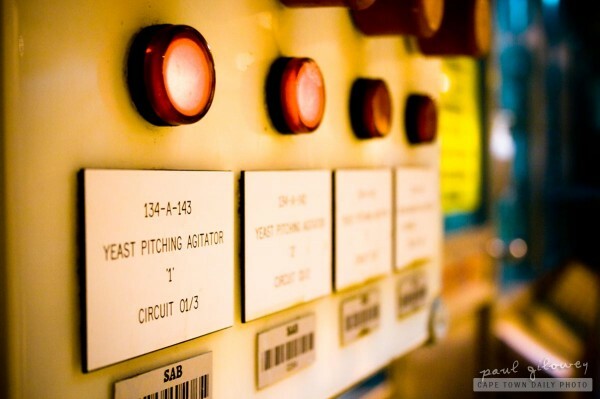 This brings me to today's photo - a series of important-looking red buttons that appear to control something called a Yeast Pitching Agitator. I know precious little about brewing beer (yes, perhaps I should have paid closer attention) but from the little bit of reading that I did it seems as though "pitching the yeast" refers to the process of adding the yeast to the raw and bubble-less beer (known as "wort"). As for the agitator - it appears as though its role in the process is to activate the yeast in the wort by means of physically stirring the mixture. Posted in General and tagged beer, factory, sign on Monday, 11 October, 2010 by Paul. Cool – glad I got it correct :) I still need to take that tour myself one day. Yeast Pitching Agitator – I thought you referred to me because of my pedantic comments on your previous post!